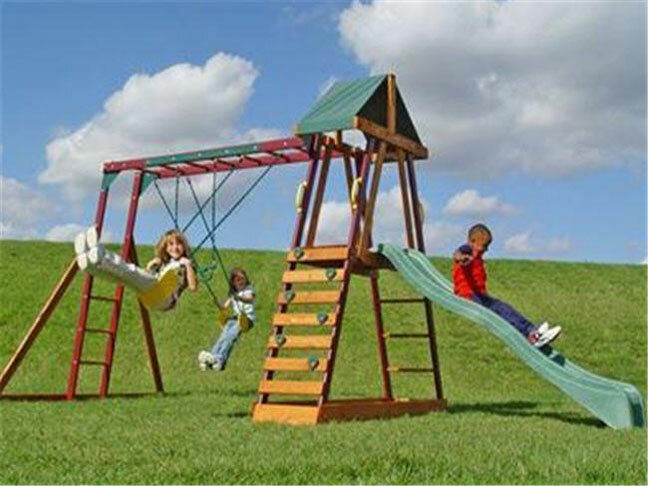 On June 29th, 2011, the U.S. Consumer Product Safety Commission, in cooperation with Adventure Playsets, announced a voluntary recall of several models of their Adventure Wooden Swing Sets due to a fall hazard. The wood in the posts of the fort sections on the swing sets can weaken due to rotting, posing a fall hazard. Approximately 240,000; a number of these products were recalled in November 2009 for a similar hazard, which listed 275,000 playsets in the U.S. and 6,800 in Canada. As of June 29th, 2011, Adventure Playsets has received more than 500 complaints reporting concern over the weakened wood in the 2×4 plastic-coated uprights. One report of a fall was received when the ladder failed, resulting in bruises and scratches. These swing sets come with swings, slides and ladders. Each set has a fort structure that uses green or cranberry colored plastic coated 2”x 4” wood upright posts and a green nylon fabric covered shade. The sets were sold under the following names: Bellevue, Bellevue II, Belmont, Durango, Durango II, Sedona, Tacoma, Tacoma II, Ventura, Venture II and Yukon,. The name is printed on the manufacturer’s instructions that came with the play set. The recalled swing set name, model number, name of the retailer and year sold can be further referenced and identified by visiting the U.S.Consumer Product Safety Commission website. Consumers should immediately stop using the recalled swing sets and contact Adventure Playsets to obtain a free repair kit. Repair kits will include the appropriate angled or vertical upright posts for each model with instructions for dissembling and reassembling each set. These Swing Sets were sold at Academy Sports (the Yukon); Mills and Menards (the Ventura/II) all from 2005 to 2007; Mills (the Belmont) in 2004; Toys-R-Us (the Bellevue/II); and Walmart (the Tacoma/II, Durango/II, and Sedona) for approximately $300-$600.